A bad boss is all you need to feel emotions you never thought could run through your blood veins. A bad boss can make you feel tired the moment you wake up in the morning. 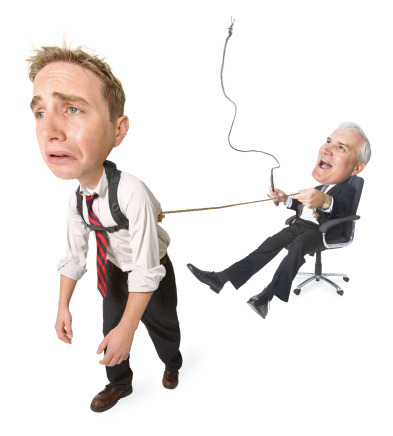 A bad boss can give you sleepless nights even though you don't sleep at the office, and a bad boss can certainly make you see how bleak life can be, and make you consider being unemployed, never mind the bills you have to pay. I've had my fair share of horrible bosses- some of them I simply stooped to conquer, some I dealt the same cards they dealt me, and some I just ignored completely for the preservation of my sanity. One boss however had me bursting at my seams in frustration after just one month of working with her. Now, if you know me, you will attest to my calmness and alarmingly slow pace to anger....but one boss made me experience such strong emotions, that I found myself considering taking a wooden spoon to work and beating the living daylights out of her. Relax, I didn't but the problem is I considered it very strongly and I was shocked at myself! I started to put together character traits that I noticed in my string of bad bosses and decided to share them. If you find out you are a bad boss in the making, don't stress, as long as you're not there yet, there's hope. You are passive-aggressive: I think some bosses mistake this trait for diplomacy. The problem with being a passive-aggressive boss is that your employees don't know how you truly feel about an issue. I'm not saying bosses need to do a dramatic display in order to express their feelings, but mixing smiles and stern words together confuses normal people who work for you. Don't say "Next time you forget to clock in, you'll get a final warning" and then smile.... There's nothing pleasant about a final warning. You enjoy seeing your employees work harder than necessary: This is a popular misconduct in most workplaces. many bosses seem to think the harder their employees work, the more productive their team is. 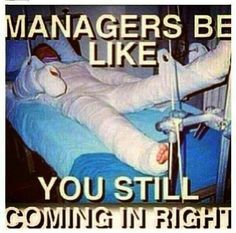 Perhaps... but there is no point in your employees working unnecessarily hard. For example, making your team stay behind after hours to work on something that could very well be done the following morning is an unnecessary imposition. Creating dramatic exaggerations of the work to be done is also unnecessary. I once worked at a lab where the manager made five of us wait for 45 minutes after closing hours to test one sample...Yeah just one,and all five of us waited because she wanted to impress this new client. Not that the results would have been any later if we had done the sample the next morning, but she derived joy in our frustration. No prizes for guessing how burned out and demotivated we all were. Let your employees enjoy the days when there isn't much to do so they can put in all their effort when the workload comes in. Burning them out every single day will not make them better employees. It will only make them intensify their hunts for better jobs. You don't listen: the best people who can give advice on how a team should be run are the team members themselves. As a boss, they are the key people to listen to because not only will they devise better ways to get the work done, they will come up with ways to get the work done and be happy doing it. Believe me, you do not want grumpy employees going through the motions in an environment they can't stand. You want employees who want to be at work, who will miss work when they are ill, and the only way to do that is to listen to their grievances and implement their reasonable suggestions. It will make your work and their work easier. You don't show appreciation: Yes, they work for you, they get paid for the job, but it doesn't mean you shouldn't acknowledge their hard work. People tend to work harder when they know their work will be acknowledged in some way...even if that way is a little piece of chocolate or a team lunch. Some bosses unfortunately only know how to dish out criticism and complaints. It's only a matter of time before your employees start to jump ship! You create division: Any boss that encourages gossip, or asks one employee to spy on the other is creating the most toxic environment ever! If you like gossip, call your friends from school and talk about who got fat or divorced. Don't create division by making some employees your source of gossip while others are made to walk on eggshells around the work place. Settle all disputes openly instead of taking sides and harboring grudges against your employees. It is immature and very frustrating. As a boss, it is a bad sign if people are constantly leaving your team to join another team within the company or leaving the company altogether.